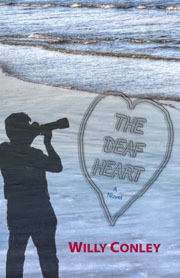 Quirky and irreverent, Willy Conley’s new book The Deaf Heart chronicles the life of Dempsey “Max” McCall, a Deaf biomedical photography resident at a teaching hospital on the island of Galveston, Texas, during the early 1980s. Max’s experiences, some humorous, some poignant, reveal his struggles and triumphs as he attempts to succeed in both the hearing and Deaf worlds. See Willy Conley discuss The Deaf Heart in the book trailer. Order your copy online at http://gupress.gallaudet.edu | Save 20% with code OCT2015 at checkout! GUPress: What do you hope to accomplish with this book? What do you want readers to take away from Max’s story? Willy Conley: I hope to provide reading entertainment in the form of a novel involving a male Deaf main character. To my knowledge, there are very few published literary fiction novels about an educated deaf person who works professionally in the hearing world, especially ones written from the authentic viewpoint of a deaf writer. It never ceases to amaze me how little the general public knows about the various types of deaf people in the world and their struggles and joys in everyday life. There are still people who see us as a walking, one-dimensional disability: can’t hear; therefore, can’t speak or think or do. Whether Deaf or hearing, I would like readers to absorb “the Deaf experience” to get a sense of what that is like from Max’s unique worldview. I also want them to realize the universal human experience of overcoming obstacles and prejudice. This book has truly been a labor of love for it showed me how much fun it is to explore the Deaf experience in fiction. GUPress: Max attends mainstream schools until college, where—for the first time—he discovers a Deaf community and forms a Deaf identity. How did that change him as a character, and how important is that in your own life? This was one of the very few places in the novel where there is a bit of truth with Max’s life mirroring mine. GUPress: Themes of friendship, loss, and acceptance bear heavily on your work. Would you consider Max’s experiences as uniquely Deaf experiences? Willy Conley: Yes and no – regarding friendship, loss, and acceptance, those were definitely universal experiences. However, some of the other things he experienced were uniquely Deaf-related. For example, when Max was called out of the blue to photograph open-heart surgery with an operating room team that he had never met before, and was not able to lipread them because of their surgical masks. Or, when he was called to help interpret for his Deaf friend. Other Deaf experiences involved being able to converse effortlessly in a loud bar without having to hear or utter a word; and getting into an elevator and being surprised by the entrance of people behind him because he didn’t hear a second set of doors opening. GUPress: You have a unique background, having trained as a biomedical photographer (like Max), then transitioning to theatre, writing, and teaching. What motivated that transition, and why did you choose to focus on biomedical photography in your novel? Willy Conley: Theatre, writing, and teaching have always been a part of my life while I studied and worked as a biomedical photographer. In fact, after I got my Registered Biological Photographer certification, I took a year off to go on a national tour with Sunshine Too, a theatrical outreach troupe from NTID. We were a nitty-gritty group of three Deaf and three hearing actors who had to write and create our own performance materials for the tour. I also wrote in journals in the van and in motels while on the road. I had a couple of short stories published in literary magazines, and I won $50 in a writing contest in the local Galveston paper. A year or so after I got settled on Galveston Island, I landed a small role in the musical “Oliver!” at the Strand Street Theatre. Incidentally, the artistic director there was fluent in ASL because he used to be the artistic director of Fairmount Theatre of the Deaf (later renamed to Cleveland SignStage Theatre) in Ohio. Before all of that, I took some theatre classes at NTID and got involved in a few shows while a student. The teaching part began when I worked as a photo lab teaching assistant at NTID. During my last year at RIT, I became an Area Administrative Assistant in the residence halls; I was the supervisor for about fifteen resident advisors and that involved a bit of training. When I began my photo residency in Galveston, I taught a basic sign language course for the hospital and a sign course at Galveston College. GUPress: This novel takes place in the early 1980s. How do you think the situation of Deaf people in the workplace has changed since then? Willy Conley: I don’t have a formal answer to this as I am not a Deaf Studies scholar nor am I a cultural anthropologist, but I believe that the passage of the Americans with Disabilities Act in 1990 drastically improved the workplace for Deaf people. I do think that similar challenges exist today, particularly incidences of audism. I’ve had a postal clerk almost refuse to process a passport application because I couldn’t understand him and asked him to write down what he was saying. He got really pissed off that I couldn’t hear him. Several different times on the phone I have “overheard” (through a relay agent’s translation) a hearing person call out to another nearby person: “Hey, I got this deaf-and-dumb guy on the phone, what do I do with him?” Or, they’ll say, “Oh no, it’s that deaf a------ again, I don’t wanna deal with him on the phone.” However, it is slowly getting better over time as awareness spreads in the community, the arts, and the media. Just visiting? Subscribe now to the Gallaudet University Press E-newsletter and receive exclusive updates, book excerpts, and discounts...absolutely free. Copyright 1999-2015 Gallaudet University. All rights reserved.